Discussions about inclusion have been more common over the last few years and while the entertainment industry is slowly moving in the right direction, it's still far from where it needs to be especially when it comes to representing people with disabilities. Enter Alexandre Franchi. Franchi first made a huge splash a decade ago with The Wild Hunt (review), a thriller set among a group of LARPers. 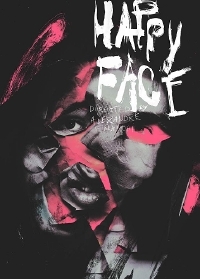 Happy Face is also the story of a group of outsiders but in this case, those outsiders are a group of individuals that can't hide from the rest of society. Happy Face stars Robin L'Houmeau as Stan, a handsome young man who changes his appearance and begins attending a support group for people with facial disfigurements. The knee jerk reaction is to despise him for his infiltration of a sanctuary where a group of people who are generally maligned are free to share their thoughts and feelings freely but as the movie progresses, we see that Stan has a much more personal reason for breaking into the group. While his execution is a little misguided, his motivation is honourable and when the group discovers what he's up to, they first push him away before allowing him back into the fold as a guide and mentor, someone who is on their side and willing to do almost anything to help this band of individuals accept themselves enough to take on the outside world. Franchi enlists a number of advocates and actors with facial deformities to tell this story, each individual playing a fictionalized version of themselves. With their help and cinematographer Claudine Sauvé, Franchi captures this diverse group of individuals in what feels like a completely authentic way. It's refreshing not only to see them speak openly with each other about their deformities and the struggles they face in daily life but as Happy Face progresses, we see them begin to step out of their comfort zone and interact with the outside world in a way that makes the majority of the population uncomfortable. Entwined is this story of marginalized individuals finding their voice is the heartbreaking story of Stan and his mother who is dealing with terminal cancer. Though he begins this journey in preparation for his mother's return from surgery, it's clear from early on that Stan is not being fully honest with himself. His mother is dying and he can't see life without her which put him exactly in the same spot as many of his new friends: surrounded by people but utterly alone. L'Houmeau gives a beautiful, emotional performance. Movies like Happy Face are hard to come by. It's funny, indignant, emotionally resonant and tackles a subject matter that most would rather ignore in a way that is both respectful and enlightening.